Now over 30 years old! Will people stop trusting the house? 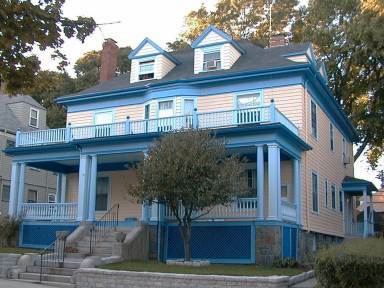 The Buttery is a house in Dorchester, Massachusetts. Over the years, many of the residents have been members of the Society for Creative Anachronism, a medieval recreation group, but The Buttery is no longer the hotbed of SCA activity it once was. Currently, seven of us live here. The house was built shortly after the turn of the previous century. It is a style of house known as a "four-square", which was popular here in Massachusetts at the time; it is called that because the shape of the house is nearly square, a very efficient shape that gives you a lot of space for the size of house. If it weren't for the complex roof line, it would be rather close to being a cube.